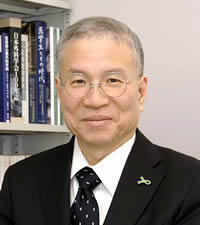 The Tokyo Metropolitan Geriatric Hospital and Institute of Gerontology (TMGH-IG) was established in 1972 and comprises a leading representative hospital (Tokyo Metropolitan Geriatric Hospital: TMGH) and an institute (Tokyo Metropolitan Institute of Gerontology: TMIG) for geriatric medicine and gerontology with many notable achievements. The TMGH and TMIG were combined to form the TMGH-IG in 2009 to become a local incorporated administrative agency; it moved to new hospital and research facilities in 2013, and since then, it has been engaged in medical care and research activities more actively than ever in this new environment with the latest facilities. In Japan, the population of 65- and 75-year old or above reached 31.9 million (25% of the total population) and 15.6 million (12% of the total population), respectively. While a society with the elderly population surpassing 21% is called "super-aged society," the process of aging in our country is expected to continue until the ratio reaches 40% in 2060. Because Japan is more advanced in terms of aging than the rest of the world, we need to think up of ways to construct a "high-quality super-aged society" on our own. The world is paying attention to how Japan will address the issues arising from a super-aged society. Our center aims to take advantage of its dual nature as being both a hospital and a research institute by engaging in research on solutions for issues raised at clinical sites dealing with the elderly and in reflecting research results gained by the research institute on the clinical practice in a timely manner. Within and between the hospital and the research institute, we strive to achieve a high level of cooperation, communication, discussion, and collaborative work among different hospital departments and research teams to enhance each other's motivation and engage in medical practices and research activities. We hope to be able to contribute to the healthy longevity and improvement of the quality of life of the elderly by engaging in clinical practices and research on diseases common to them, such as cardiovascular disease, malignant tumors, dementia, lifestyle-related diseases, osteoarticular diseases, and sensory organ disease, and by investigating the causes of the symptoms unique to the elderly, such as frailty and sarcopenia. The Tokyo Metropolitan Geriatric Hospital is an acute care hospital operating with over 1000 staff, including approximately 150 full-time physicians, 90 part-time physicians, 500 nurses, and 170 medical technicians. The hospital is also supported by a large number of local volunteers. The hospital specializes in the treatment of health issues that are common in the elderly, such as cardiovascular diseases, cancer, and dementia; further, it utilizes the skills of its excellent medical team and the full range of medical equipment to provide treatment for other diseases as well as emergency care services. The hospital offers medical care for all health-related issues except those related to the fields of pediatrics and obstetrics. In June 2013, the hospital relocated and subsequently acquired new equipment and technology including PET/CT, 320-row CT, and 3-tesla MRI scanners and hybrid operating rooms. Though the hospital was already providing advanced medical treatments, such as revascularization for venous leg ulcers and treatments based on genetic diagnosis, its relocation increased the variety of the available advanced treatments. The hospital has recently introduced minimally invasive surgery using endoscopic and catheter-based procedures. In the past two years, there has been a rapid increase in the number of medical cases involving highly specialized procedures and demanding extensive experience, including endoscopic submucosal dissection (ESD), endoscopic ultrasound-guided fine-needle aspiration (EUS-FNA), and stent grafting for the treatment of thoracic and abdominal aortic aneurysms. The hospital is striving to satisfy the needs of all patients with regard to the medical treatment environment, with a focus on outpatient services and large wards that fully consider the importance of patient privacy. The hospital is committed to providing (1) high-quality medical care, (2) medical care that considers the quality of life of patients after discharge, and (3) collaborative approaches to medical care between medical institutions and nursing care facilities within the community. Moreover, maximum support will be provided during discharge to ensure that patients are able to lead smooth lives after discharge. If you wish to undergo a medical examination at the hospital, please bring a referral letter with you from your local physician. This will help us understand the conditions of your illness and any treatment received to date, thus enabling us to provide appropriate medical treatment in a swift and efficient manner. The medical team at the Tokyo Metropolitan Geriatric Hospital is making concerted efforts, incorporating rapid advancements in medicine and medical treatment, and providing safe and secure medical care so that our elderly and middle-aged patients can enjoy an active life. We hope that an increasing number of patients will consider the Tokyo Metropolitan Geriatric Hospital as their preferred healthcare provider. 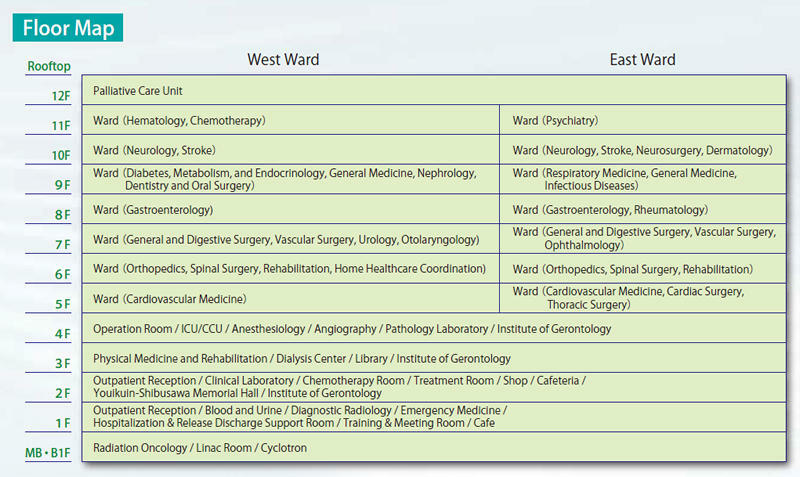 ※Please note that not all clinical divisions operate consultation services every weekday. ※On Saturdays, only the emergency medicine department is open. Reinforced concrete construction/ partial steel framed structure, steel-framed reinforced concrete construction. The Tokyo Metropolitan Geriatric Hospital and Institute of Gerontology plays a part in the creation of the urban model of a super-aged society in metropolitan Tokyo with the aim to achieve healthy long life through health promotion for the elderly. To this point we will provide appropriate medical care in accordance with the characteristics of the mental and physical conditions of the elderly, coordinate research and clinical practice, and conduct research to maintain and improve the QOL of the elderly. As our aging society rapidly progresses, the medical need for the elderly has become increasingly diverse. As a specialized medical institution for the elderly, Tokyo Metropolitan Geriatric Hospital and Institute of Gerontology is working to enhance its function. Taking advantage of the benefits of integration of research and medical care, we provide highly-advanced vascular diseases medical care, cancer care for the elderly, and dementia medical care. We promote appropriate inpatient treatment planning and discharge support in accordance with the disease states and symptoms of each individual patient. As a secondary emergency medical institution, we prepare emergency protocol to ensure the safety of local citizens. Any patient with any medical conditions has equal rights to considerate and respectful care. Every patient has the right to receive respectful care, in collaboration with the physicians, nurses and other healthcare professionals. A patient has the right to an explanation concerning his/her diagnosis, treatment, medical procedures, and prognosis in terms he/she can understand. A patient has the right to make decisions about the plan of care before and during treatment. A patient has the right to review the records about his/her care and to have the information explained or interpreted as necessary, except when restricted by law. A patient has the right to security, personal privacy and confidentiality of information concerning his/her medical care. A patient has the right to consent to or decline to take part i n research studies or human experimentation affecting care and treatment or requiring direct patient involvement, and to have those studies fully explained prior to consent. A patient who declines to take part in research or experimentation is entitled to the most effective care that the hospital can otherwise provide. A patient is responsible for providing, to the best of his/her knowledge, accurate and complete information about complaints, past illness, hospitalizations, medications, and other matters relating to his/her health. It is a patient's responsibility to actively participate in his/her care by asking his/her provider what to expect regarding his/her treatment, discussing options, and informing his/her provider if there is something he/she doesn't understand. A patient is expected to be considerate and respectful of the r ights and properties of other patients and hospital personnel, and to comply with hospital regulations. The Tokyo Metropolitan Geriatric Hospital and Institute of Gerontology was established in 1872, a historical institution which was originally founded as a "sanatorium". It was re-established in 1972 as facilities for the elderly population including the hospital for the elderly, the Institute of Gerontology, open to any Tokyo resident. It has since stayed one step ahead in dealing with the aging society of today. 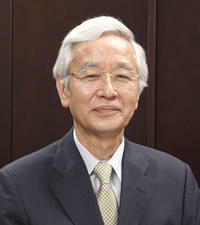 In 2009, the Tokyo Metropolitan Geriatric Hospital and Institute of Gerontology started operations as a local independent administrative agency which integrates a research institute and a hospital. In spring of 2013, a new facility was constructed, evolving in response to the social needs of the era. 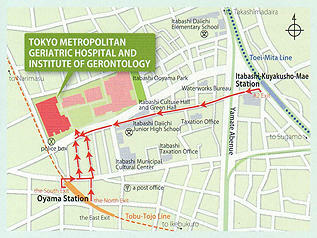 Copyright(C)Tokyo Metropolitan Geriatric Medical Center All Rights Reserved.